Root canal treatment or endodontics is a dental procedure which involves removing bacteria inside a severely decayed or fractured tooth and cleaning its root canals. Each tooth contains pulp, a soft tissue inside with nerve and blood vessels that travel all the way down the root. If a tooth has a leaky filling, tooth decay or damage as a result of trauma, such as a fall then bacteria can enter inside the tooth and infect the soft tissue which then becomes inflamed. This also causes tremendous pain through the nerves. Root canal treatment is only required when it's clear that the soft tissue at the centre of the tooth, has been damaged by a bacterial infection. Root canal treatment has a high success rate and its purpose is to eliminate and prevent disease reoccurring inside the tooth. At Freedom Dental we will disinfect and thoroughly clean the canals removing the bacteria within the affected tooth. This is a highly skilled and difficult treatment. Each case is individual and some can be very complex, but generally the treatment may take anywhere between one and two hours and you may have to return for a second visit. Your dentist will open your tooth through the crown – the flat part at the top – to access the soft tissue at the centre of the tooth (pulp). Your dentist will then remove any infected pulp that remains. Your dentist will use a series of small files to enlarge the canals and make them a regular shape so they can be filled. This part of the treatment may take several hours to complete and may need to be carried out over a number of visits. Your front incisor and canine teeth (biting teeth) usually have a single root containing one root canal. The premolars and back molar teeth (chewing teeth) have two or three roots, each containing either one or two root canals. The more roots a tooth has, the longer the treatment will take to complete. At your next visit, the temporary filling and medication within the tooth will be removed and the root canal filling will be inserted. This, along with a filling, will seal the tooth and prevent re-infection. In some cases, a root-filled tooth may darken, particularly if it has died due to an injury, such as a knock to the tooth. There are several ways your dentist can treat discolouration, such as whitening the tooth using chemicals. No. Usually, a local anaesthetic is used and it should feel no different to having an ordinary filling done. The alternative is to have the tooth extracted. Once the pulp is destroyed, it can't heal and it is not recommended to leave an infected tooth in the mouth. Although some people would prefer an extraction, it is usually best to keep as many natural teeth in the mouth as possible. Whilst root canal treatment is available on the NHS you must also be aware that you have the option of being referred to see a specialist in this field for your treatment. Average costs for this are around £700. 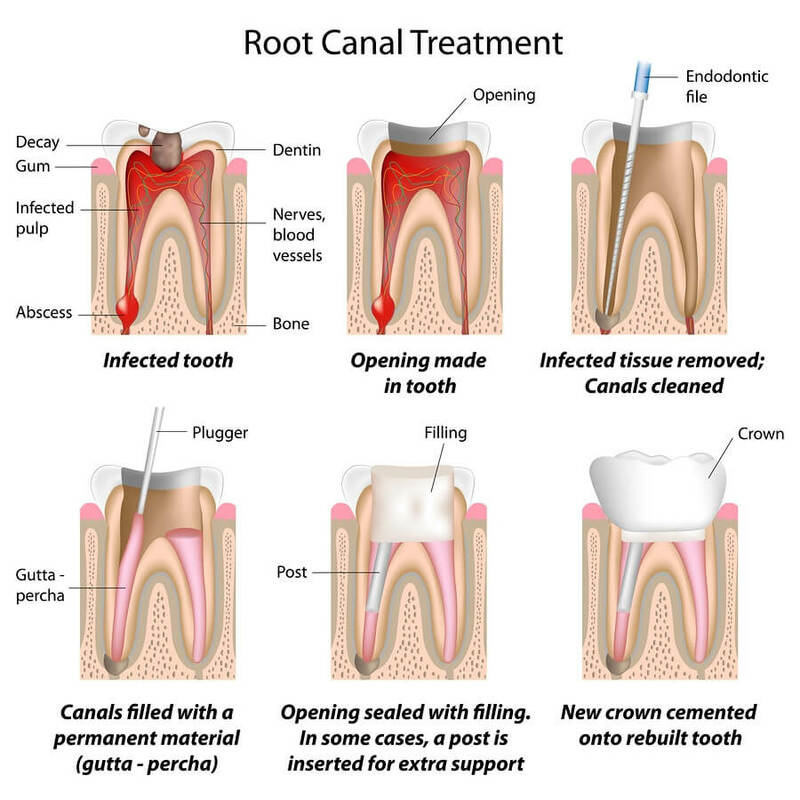 For more information about root canal treatment, please feel free to call Freedom Dental on 0161 486 6821 or click here.